The terms counselling and psychotherapy are often used interchangeably, however both have some inherent differences.�Counselling�is often focused on a specific problem or set of problems, and is typically a shorter process.�Psychotherapy�is often a deeper process of examining and treating difficulties in mood, personality, or adjustment that draws from a wide variety of tools and techniques. Psychotherapy is also a term that is protected under legislation and indicates that the therapist has obtained more advanced training. All services are offered in the form of individual and/or couples therapy. I have over 15 years experience and draw from a wide variety of techniques and strategies that have been proven to be effective, such as CBT (Cognitive Behavioural Therapy) and EMDR (Eye Movement Desensitization and Reprocessing). You may be eligible for coverage through your extended health plan. 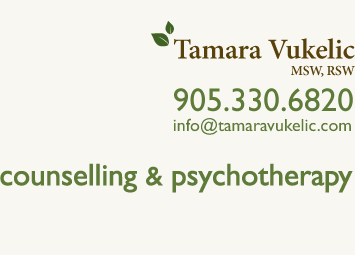 To find out if counselling is right for you, please contact me for a free consultation. I look forward to hearing from you.